What will it take for the Broncos to play in the Super Bowl? Ever since the Denver Broncos beat the Super Bowl champion Baltimore Ravens by 22 points in Week 1, they’ve been billed as the team to beat in the AFC. With the way Broncos quarterback Peyton Manning has played this season, it’s difficult to argue. Yet, that doesn’t mean Denver will just roll through two playoff games on its way to a Super Bowl berth. In fact, the road could be quite difficult. The other three teams still alive in the AFC – Indianapolis, New England and San Diego — are the only three teams to beat the Broncos this season. Here’s a breakdown of what each of those teams did to beat the Broncos the last time they played and what Denver will have to do to beat them the second time around, beginning with the Chargers this week. After Denver beat San Diego in Week 10, the Chargers got the Broncos back in Week 15, holding Manning to a 92.4 passing rating, his second-lowest of the season (average: 115.1). They also had a sack and an interception. The Chargers’ defense played Debo the second time they faced the Broncos this season. They bullied Manning and his offense throughout the game to defeat Denver 27-20 in Denver. It was evident that defensive coordinator John Pagano and his men had benefitted from playing the Broncos once before. They held Denver scoreless in both the second and third quarters and to 2 of 9 on third down. San Diego also allowed only 18 yards rushing and forced three three-and-outs. The Broncos defense, on the other hand, played the role of whipping boy and couldn’t get off the field. Unlike last season, the Broncos have been underwhelming at times on defense due to significant injuries and poor individual performances. Last year Denver ranked No. 4 in the NFL in fewest points allowed per game. This year, it ranked No. 22. Most frustratingly for Broncos fans is their defense’s inability at times to get off the field on third down. The Broncos’ defense was No. 1 in the NFL last year on third down, allowing opponents to convert only 31 percent of the time. 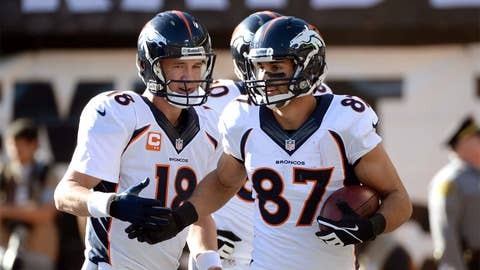 This year the Broncos ranked 16th (38 percent). In their victory over Denver, the Chargers planned to dominate the time of possession with a simple plan of attack: run it down their throats. The plan proved effective as the Chargers held the ball for an eye-popping 39 minutes. They were able to rush the ball 44 times for 177 yards — a four-yard average. San Diego converted 50 percent of its first downs. If the Broncos want to beat the Chargers this weekend, their defense must reverse the roles that were played by each team’s defense in their last meeting. To go from whipping boy to bully, Denver defenders have to stop Ryan Mathews and the Chargers’ run game and get off the field on third down. Peyton and his high-powered offense can’t work their magic when they’re being held hostage on the sidelines by their own defense. And don’t think the Broncos’ offensive line hasn’t been gearing up the last two weeks to give the Chargers a taste of their own medicine on the ground this go ‘round. The Broncos rushed for a disgraceful 18 yards in Week 15, and you can be sure they’ll want to take their man-cards back. Manning is one of the greatest quarterbacks to ever play the game, but he’d have to pull off a miracle at Mile High if their offense is one-dimensional again. If Denver beats San Diego, it will play the winner of Indianapolis-New England for a trip to the Super Bowl. We’ll start with the Colts. How did the Colts spoil Peyton’s homecoming in Week 7? They hit him often. Indy held Manning to his second-lowest completion percentage of the year at 59.2 percent (average: 68.3), picked him off once, recovered a fumble and recorded four sacks. Not only did Colts pass rushers put a beating on Manning, their defensive backs played press coverage most of the game and put a beating on the receivers too. They disrupted the timing of the opposing receivers’ routes, forcing Manning to hold the ball longer than he usually has to. The defenses that have forced Manning’s worst performances this season have adopted this exact philosophy. When I studied this game tape, I wouldn’t have had to watch past the first half to figure out the Colts’ defensive formula for success against Manning in their 39-33 win over the Broncos. The Colts played press coverage (either Press Cover 2 Man or Press Cover 1 Rover) on 13 of Manning’s 18 pass attempts in the first half. How did Peyton and his receivers do? Not well: 6 for 13 (46 percent) and a sack. When the Colts didn’t play press coverage, they played Cover 4 (three times) and ran a Fire Zone Blitz, and Manning was 4 for 5 (80 percent). Moral of the first half: play press coverage against Peyton Manning. Take a look at the two photos below to see how the Colts took away Manning’s primary target on this crucial third down. As you can see, the arrow pointing at No. 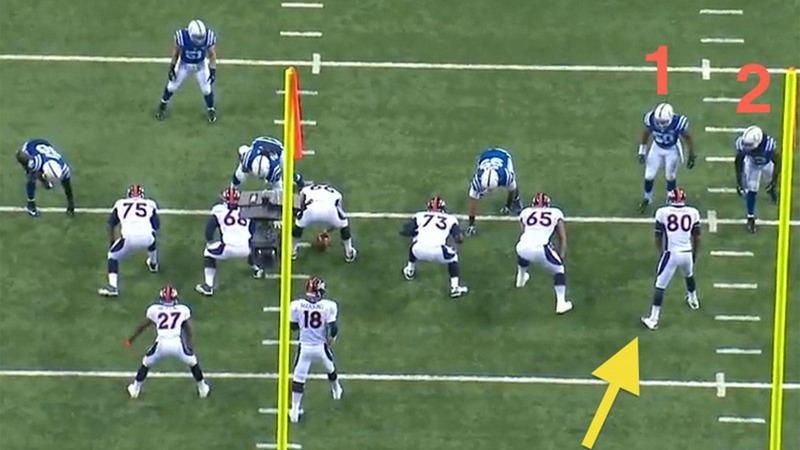 80 Julius Thomas identifies him as the primary target, and Indianapolis assigns two defenders to immediately engage him after the snap. The other defensive backs were in tight press coverage on this down, too, and play resulted in a sack. If the Broncos face the Colts again, they’d better expect to get another large dose of press coverages. The receivers must win one-on-one battles at the line of scrimmage to get space to operate and to give Manning a large enough window to throw into so he’s not always forced to thread the needle. 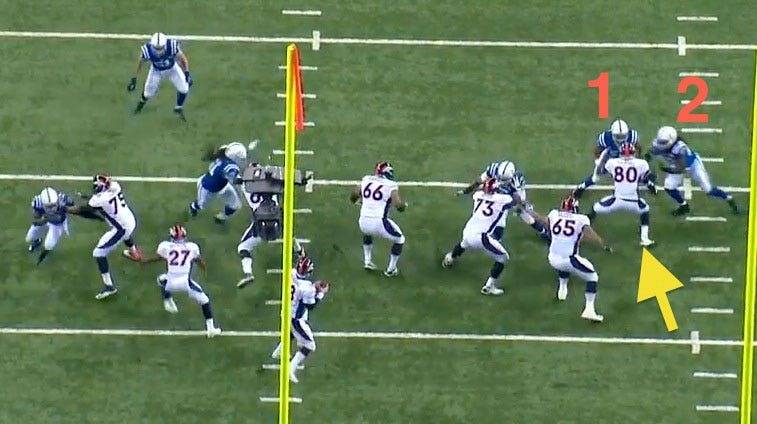 They don’t have to stay open for a long time, but they have to get open early in the down so Manning can get the ball out of his hands quickly. Expect the Broncos to run more “rub” or “pick” routes. This will force the Colts’ defensive backs to back off in their initial alignments so they aren’t running into each other, giving Manning an opportunity to hopefully make his throws without taking so many hits. In their 34-31 roller coaster-like overtime victory over the Broncos in Week 12, the Patriots’ defense utilized the same method of operation other defenses have to shut down Manning’s offense: tight, physical, press coverage by the defensive backs. The Patriots held Manning to his lowest completion percentage of the season (52.8), his lowest passer rating of the season (70.4), sacked him twice and intercepted him once. A wise coach once told me: In order to win in the NFL, you need to be like a chameleon and adapt to the circumstance. When Peyton was being pummeled by the Pats, Denver turned to the ground game to the tune of 48 attempts for 280 yards and two touchdowns. Knowshon Moreno was like a poisoned arrow rushing 37 times for 224 yards, almost potent enough to defeat the Patriots on his own by attacking their Achilles’ heel. It wasn’t the way we’re accustomed to seeing the Broncos move the ball and put points on the board, but they moved it nonetheless and still put up 31 points. This was a sloppy, sloppy game. New England fumbled the ball six times and lost three of them. But the Broncos also fumbled five times, losing three of them, and Manning threw an interception too. The Broncos didn’t just shoot themselves in the foot — they took an uzi to it. Final turnover tally: Denver 4, New England 3. Fumbles have been a problem for the Broncos all season, not just against the Patriots. No team in the NFL has lost more fumbles than the Broncos, with 16 on the season. If the Broncos want to avoid another bitter defeat to the Patriots, they’ll have to deploy another heavy dose of Knowshon Moreno and simply eliminate the turnovers. Even with four turnovers, they took the Pats to OT in Foxborough, so it’s not like the Broncos were far off. The Patriots will surely use the same defensive game plan they used in their last meeting to shut down the Broncos pass game, and why wouldn’t they? Tight press coverage has been kryptonite to Super Manning all season. Unlike against San Diego and Indianapolis, where more substantial adjustments are required, the Broncos don’t have to reinvent a game plan against New England. They have one that works. They just need to hang onto the rock, because in another tight game they can’t afford to give Tom Brady extra possessions like they did the last time they played him. Coy Wire is a college football analyst for FOX Sports 1. He played college ball at Stanford before spending nine years in the NFL with Buffalo and Atlanta as a linebacker and safety.